Does Shaving Your Armpits Reduce Sweat? Treating and concealing sweat stains is a full-time job. At some point, you've probably asked: Does shaving your armpits reduce sweat? It’s a valid question. And in this post, we’ll discuss how armpit hair affects sweat and ways to control pit perspiration. The short answer is no — shaving your armpits won't make you sweat less. However, trimming or shaving your armpit hair can help make antiperspirant more effective and reduce the appearance of sweat stains on your shirts. Here’s why shaving your armpits won’t physically make you sweat less. Sweat happens when your internal body temperature gets too high. You also sweat when you're nervous, stressed or anxious. These things have nothing to do with your armpit hair and everything to do with your eccrine and apocrine sweat glands — both of which are located under your pits. Your eccrine glands perspire when you exert yourself and increase your internal body temperature. Your apocrine glands react to stress signals from your brain. These two factors alone dictate how much you sweat. It doesn’t matter whether you have armpit hair or not. The long, fluffy tufts of hair under your armpits worsen the appearance of sweat stains for two reasons. Because hair accumulates and holds moisture more than your naked skin, you pit out faster when you have it. Armpit hair also blocks antiperspirant from penetrating the skin’s surface, plugging your sweat glands and stopping sweat. If you have armpit hair and sweat more than average, you might get big wet armpit stains quickly even while wearing antiperspirant and an undershirt. Shaving or trimming your hair could help keep your shirts dry a little longer. If you’ve never shaved your armpits before, it can be a little intimidating. But don’t worry, it’s easier than shaving your face — we promise. Before you shave your pits, rinse them with warm water — ideally in the shower. The heat and moisture help soften your hair follicles and make nicks and tugging less likely. Once your armpit hair is thoroughly soaked, wash your pits with soap as usual. Then, exfoliate. It’s essential to remove dead skin and make the surface of your armpit as smooth as possible. A softer surface prevents accidental nicks. How do you exfoliate exactly? By using a body scrub. We recommend trying Olivina Men Exfoliating All-In-One Scrub — only $4.00 at Target. Just squeeze some onto a loofah or sponge and scrub away. You can use face shaving cream or gel for your armpits too. Squeeze a nickel-sized amount onto your fingers and apply a thin layer to your armpit. The shave gel helps the razor glide over your armpit smoothly. It also moisturizes your armpit hair to make it easier to cut. Don’t skip this step or use soap instead of shaving cream if you’ve never shaved your armpits before — you must condition your hair so it won’t be as coarse when you shave it. Once you apply shaving cream, it’s time to shave. You’ll probably want to use a different razor than the one you use on your face, but we recommend getting one of similar quality. It’s best to use a razor with a flexible, removable head and multiple blades. The razor head probably won’t last as long as the one you use for your face since you’ll be shaving longer, coarser hair with it. To shave your armpit, raise your arm and put your hand on the back of your neck. Doing this creates a flat shaving surface. Then, lightly glide the razor over your armpit from top to bottom. Use the same amount of pressure as you would on your face. After you shave most of the hair off from top to bottom, shave from bottom to top, and side to side. Unlike facial hair, armpit hair grows in multiple directions. Keep shaving until you remove all of the hair. After you remove all of the hair from both armpits, dry them thoroughly before applying any antiperspirant or deodorant. Applying products directly after you shave stings — wait a few minutes before you do this. You also want to make sure the pit is completely dry before putting on antiperspirant. When your armpits are wet, it can prevent antiperspirant from soaking into your glands and stopping sweat. Not quite sure if you’re willing to shave your armpits? There are other alternatives. If you’re not willing to shave all your armpit hair, try trimming it instead. Use an electric hair clipper to trim your armpit hair. It’s faster and more comfortable than shaving — and requires less upkeep. If you have straight armpit hair, cut your armpit hair down to an inch or less. This length will be short enough to reduce sweat stains, but long enough to be comfortable. You can use comb guard numbers one through eight. If you have curly armpit hair, cut it down to 1/8 of an inch using the number 1 comb guard. The hair will be long enough that it won't itch or poke but short enough to reduce sweat stains. If trimming and shaving don’t sound like realistic options, try a sweat proof undershirt like the Thompson Tee instead. 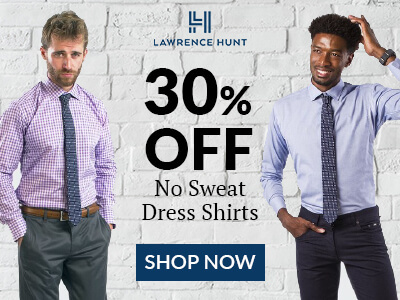 This soft undershirt has built-in sweat guards that prevent sweat from staining your shirt all day — guaranteed or your money back. The Thompson Tee comes in many styles and colors, so you can wear one by itself or discreetly under any shirt.